Abortion, Presidential Power and Civil rights: A Debate on the Nomination of Samuel Alito to the Supreme Court | Democracy Now! Nan Aron, President of Alliance for Justice which is a national association of public interest and civil rights organizations. Sean Rushton, Executive Director of the Committee for Justice. AMY GOODMAN: We’re joined by Nan Aron, President of the Alliance for Justice, which is a national association of public interest and civil rights groups opposing Samuel Alito’s nomination for the Supreme Court. Also on the phone with us from D.C. is Sean Rushton. He is with the Committee for Justice, which has come out from day one in support of Samuel Alito. We welcome you both to Democracy Now! Sean Rushton, let’s begin with you. Why do you support Judge Alito? SEAN RUSHTON: Well, first of all, because Judge Alito has a fantastic background. He is arguably the most qualified nominee to be put forward for the Supreme Court in the last 70 years. He has been an appellate court judge the last 15 years with a superb record of sticking to the facts, to the four corners of the cases that come before him, and following Supreme Court precedent and the Constitution by the book. He was a federal prosecutor before that, and he has a great educational background before that with degrees from Princeton and Yale. So, I think that’s — our main reason for supporting him is he’s a great and qualified candidate. AMY GOODMAN: Nan Aron, your response? NAN ARON: Well, first of all, thank you for having me on the program. I listen to your show every morning, and I love it. No one disagrees with Sean Rushton’s assessment or that, for the matter, of the American Bar Association, which found Samuel Alito qualified. I don’t know that any of us have any disagreement with his technical, professional qualifications. The issue for us, for the Senate and for the American people, is whether he possesses an open mind, whether he’s fair-minded and whether he will rule on the merits of each case, as opposed to his own view of the law. And in a 168-page report issued by the Alliance for Justice last week, we document how time and time again, issue after issue, he comes down on the side of big business, big government, at the expense of ordinary people, as well as sides with government, governmental power, and government’s ability to intrude on our personal lives. These are very, very serious issues. 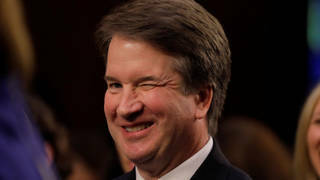 And I believe at the end of the day, these Democrats, as well as some Republicans, we’re hoping, will discover through these hearings that he is not a suitable justice for the Supreme Court. SEAN RUSHTON: Well, we have very different pictures, with all due respect. Nan and her coalition have said the same thing about Chief Justice Roberts and, of course, have said pretty much the same charges for the last 20 years against conservative Supreme Court nominees going back to the 1980s. So we’ve heard this, of course, in the first four years of the Bush administration against the President’s appellate nominees in many cases, people like Janice Brown and Priscilla Owens. So, the good news for us from a political standpoint is the “boy who cried wolf” factor. I think there’s a limit to how many times you can use the scare rhetoric and that people take it seriously. AMY GOODMAN: Let me ask you something, Sean Rushton. In a 1985 job application to be Assistant Attorney General in the Justice Department, Samuel Alito admitted he personally believed “the Constitution does not protect a right to an abortion.” Are you hoping at this point that the right to abortion will be struck down? Is that one of the hopes of the Committee for Justice? SEAN RUSHTON: Well, let me put it — I’m not sure our organization has a view of Roe_, as such, but let me speak personally. I’m not necessarily anti-choice, personally. But I am very anti-Roe v. Wade_. And the reason I’m anti-Roe v. Wade is because I think it is classic judicial overreach. I think it’s excessive and really amounts — when we talk about activist judging, judges making out of whole cloth the law, Roe is really the case in point that we, I think, would cite. And there are many, many people, many respected jurists of the left who have said so over the years, people like Cass Sunstein from the University of Chicago, Alan Dershowitz from Harvard and others. And, of course, most famously, Ruth Bader Ginsburg, herself, before she was on the Supreme Court, said that Roe was probably an overreach and was poorly reasoned and poorly organized. So I think it’s perfectly legitimate to say that there are faults and problems with Roe v. Wade. That doesn’t necessarily mean that thirty years after Roe, sitting on the court now, that Sam Alito or any other conservative — because, by the way, I would add that conservatives, unlike liberals on the court, tend to take precedence seriously. So, I think, once on the court, it’s very difficult to know whether or not he would take a skeptical eye about Roe, but not reverse it, or, you know, but if he would, let’s say, not extend it all the way to partial-birth abortion, for example, or parental consent laws for minors. And I think that’s many of the issues that are actually at stake here versus striking down the whole thing. NAN ARON: Well, Sean, I don’t know where to start. First of all, while Ruth Bader Ginsberg — and I know that Law Review article. That article you’re referring to, it was written decades ago, and, yes, she quarreled with maybe the reasoning in Roe, but she certainly supported the holding, as have other academics and prominent thinkers, so I think we have to be very clear about that, and even Republican senators. And you will hear Senator Specter today, as well as this week, talk about Roe as settled law. So I don’t know that any of these thinkers want to overturn Roe v. Wade. It is just a handful of individuals and organizations, and it’s very clear what these organizations seek to do. I think their motives were made very real when George Bush was forced to withdraw the nomination of Harriet Miers, because she did not present, as Sean Rushton and his cohorts wanted her to, a very clear vision as to where she was headed where Roe v. Wade and other important landmark decisions are of concern. AMY GOODMAN: Let me ask about the latest controversy now in Washington around spying and about Judge Alito and his record on the issue. Samuel Alito wrote about warrantless wiretapping before, in 1984, while working in the Reagan administration. He wrote a memo backing the idea of giving President Nixon’s former attorney general, John Mitchell, absolute immunity for warrantless wiretaps in the 1970s. Nan Aron, your response. NAN ARON: Absolutely. And I’m glad, Amy, you’ve brought that up, because I think what Sean and his friends would like us to do is have a hearing for a week on abortion, but the fact of the matter is Alito’s record strikes at the heart of so many issues and concerns of Americans, and clearly one issue on all of our minds these days is that of national security, and Sam Alito, as a lawyer at the Justice Department, tried to make it easier for the Attorney General and the President of the United States to engage in eavesdropping. He has supported, through speeches he gave recently at the Federalist Society, the notion of the unitary executive, supported the notion that what a president says upon signing a piece of legislation is just as important as what Congress says when Congress writes legislative history. Well, that’s not right. We, as I think Senator Leahy stated so eloquently yesterday, we are a nation of checks and balances, and each branch serves as a check on the other, and I don’t know that anyone in this country wants a government whereby the executive branch runs roughshod over the rights and liberties of all Americans and, in particular, tells Congress what it can and can’t do. This will be a very major focus of this hearing. We heard a little bit from senators yesterday, who laid out their plans and their series of questions, and I personally am very pleased that the hearing will address a broad range of issues. AMY GOODMAN: Sean Rushton, your response, especially starting with the issue of spying. SEAN RUSHTON: Right, well, Judge — or Sam Alito — he wasn’t a judge then, his view was slightly to the left of the one argued by advocates from the Carter administration. So if those views on executive power make — and spying, or not spying, but executive power in that case, amount to, you know, far right views, I suppose, by Nan’s light, the Carter administration people were far right, but more broadly, I think if Nan and her far-left colleagues wish to have a debate in which they say that the President has too much power in fighting the war on terror and should be weakened in his role undercutting America’s enemies, I think that we’ll probably stand aside for the whole week and not say a word. NAN ARON: Look, I need to say that I think that a lot of what the President has done and, frankly, admitted to, that is, engaging in illegal wiretapping, a lot of these issues will be presented before the Supreme Court, and it’s very clear that when President Bush appointed not only Sam Alito, but John Roberts, what was uppermost in his mind I think was not necessarily Roe v. Wade, but whether or not these two justices would be solid votes in his camp to uphold presidential — expansive presidential powers. It’s clearly going to be an issue. It should be an issue. We live in extraordinary times right now, where this admission is just startling and has enormous ramifications for all of our rights and liberties as American people. It is very important for the senators to ask Sam Alito very tough questions about these issues, about his role in promoting the notion of expanding presidential powers, because all of us want and desire a right to privacy, a right to be left alone, a right to be free from government intrusion. Sam Alito, if you look at his 15-year record on the Third Circuit Court of Appeals, you see a judge who has consistently supported government intrusion, whether it’s strip searching a ten-year-old girl, illegally strip searching, conducting — allowing the search of a ten-year-old girl, whether it is paving the way for eavesdropping and whether it’s intruding on a woman’s right to choose. This is a man who, if confirmed, will be a solid vote to violate our right to privacy. I think that’s very, very serious. AMY GOODMAN: Sean Rushton, last response, as we move in today to the first day of hearings for Samuel Alito to be Supreme Court justice. SEAN RUSHTON: Sure. Thanks, Amy. Let me refocus the debate. In 2005, the Supreme Court decided Kelo v. New London, which trampled private property rights on the side of — against individual property owners. It also, in a federal court in Nebraska, struck down a law preventing marriage from being redefined. We had “under God” taken out of the Pledge of Allegiance by another federal court. We had partial-birth abortion once again upheld by a federal court. The death penalty was weakened in Roper v. Simmons, and the Ten Commandments were taken out of public place, and the military wasn’t allowed to recruit on college campuses in another case. Those are the types of issues that, I think, motivate not only my organization and our allies, but I think 60, 70% of the country. AMY GOODMAN: Sean Rushton, let me just end with: Do you think he will be approved? SEAN RUSHTON: I do think he will be approved easily. AMY GOODMAN: Well, Sean Rushton, Executive Director of Committee for Justice; Nan Aron, President of Alliance for Justice, thank you both for being with us.